Sooner or later you’ll need a new roof installed on your home. Most roofs today last from 15 to 50 years depending on the quality of the roofing materials installed. And when it comes time to have a new roof in Hartland Michigan installed on your home there will be some choices you’ll need to make when it comes to your new roof. In this article I will go over some of the choices you’ll be faced with and explain them to help you get the best outcome from your roofing project. If you roof needs to be replaced it’s always best to understand some of the processes and methods used to install a new roof. 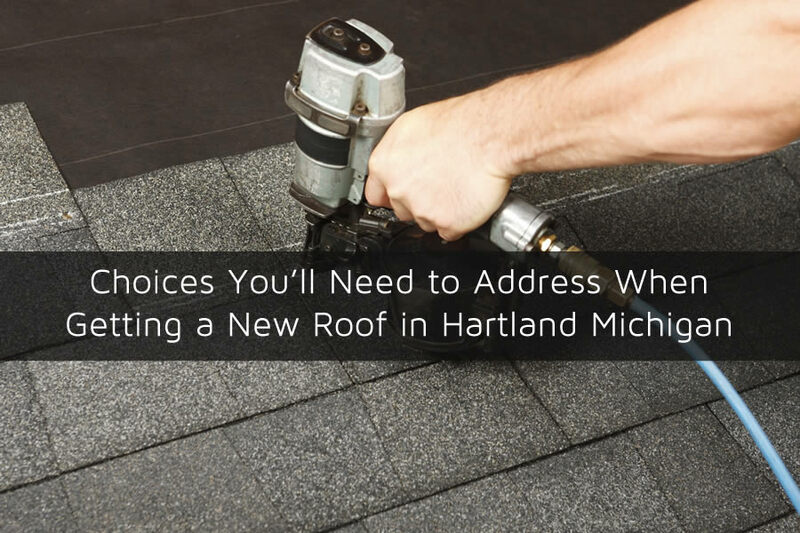 This can not only help you understand pricing points behind the different choices but it can also help when determining a time line and any associated costs for the new roof in Hartland Michigan. At Livingston Roof Pros we can answer any questions or concerns you have about your new roof and explain things a bit more in detail if you need clarification on any of the choices listed below. Simply give us a call at 517-940-8770 to learn more and speak with a certified roofing professional. At Livingston Roof Pros we can answer any questions or concerns you have about your new roof and explain things a bit more in detail if you need clarification on any of the choices listed below. Simply give us a call at 517-940-8770 to learn more and speak with a certified roofing professional. One of the biggest choices you’ll need to make when it comes to your home’s roof is the type of roofing materials used. Asphalt shingle roofing is the most common type of roofing used today. It’s very popular and used on most homes today because it’s inexpensive when compared to other roofing materials and it lasts a long time. In fact, asphalt shingles have been around for many decades and it continues to provide protection for home across Michigan. There are different quality and designs when it comes to asphalt shingles which can include the lower quality 3 tab shingles to more longer lasting architectural shingles. You can even choose to use the impact resistant shingles which can withstand more than standard architectural shingles but look almost identical. Impact resistant shingles can help protect your home better against hail and ice. Higher quality roofing materials will usually carry a longer warranty as well. Another choice that you’ll need to make when getting a new roof installed is just what you’ll be doing with the old roof. There are basically two types of procedures that is used to replace an asphalt roof. The first is called re-roofing. During a re-roofing project the old shingles are left in place and a new layer of asphalt shingles are laid directly on top of the old roofing materials. As you can imagine this process is less expensive as it removes lots of labor associated with removal of the old roof. It can also reduce the debris removal costs and disposal as your old roof is left in place. The other method of replacing the roof involves removing all of the old shingles from the roof. This method of roof replacement is call tear off or shovel off. All of the old shingles are removed and the roof decking is exposed. Although this method is more expensive it is also better as it may expose problems with the roof decking and this can be easily repaired while the roof is removed. A new layer of roofing is then attached to the roof to protect the home. All of the debris and old roofing materials are removed and disposed of properly. Is your roof failing and needing to be replaced? For a new roof in Hartland Michigan be sure to use a fully licensed and insured roofing contractor to install the new roof. At Livingston Roof Pros we can install a new roof on your Hartland Michigan home in as little as one day. We are also fully licensed and qualified to work with many of the major roofing material manufacturers. Give us a call today to learn more about our roofing services or to get a free estimate.